From a very young age, Kim was a naturally gifted vocalist. Although she did not start formal vocal training until age 17, she won her first competition at the age of 7 in Tennessee performing against others several years older. Her family then moved to Naperville, Il where some favorite leading musical theater roles included: Kate in Kiss Me Kate, Bunny in Babes in Arms, Aldonza in Man of La Mancha, and Winifred in Once Upon a Mattress. Taught and mentored by the great soprano Amanda Halgrimson, Kim found herself immersed in opera and classical repertoire and was accepted to Indiana University as a vocal performance major. However, after developing a love for jazz and rhythm and blues, her musical aspirations took a different turn and she was accepted to Berklee College of Music on a jazz masters scholarship as well as the Cleo Laine scholarship for up and coming vocalists. While at Berklee, Kim was privileged to perform with the likes of Delfeyo Marsalis, Layla Hathaway and Paula Cole and toured the East Coast with the Dennis Montgomery Singers, a small gospel ensemble formed from the larger, Reverence Gospel Ensemble. Upon moving back to Chicago in 1988, Kim found herself the featured vocalist for two of the city's major entertainment destinations. She began the inaugural season on the Spirit of Chicago and stayed for the first three seasons before being asked to help create the musical concepts and atmosphere for Odyssey Cruises where she remained the featured vocalist from 1991 until 1999. Since then she has spent her time working with different orchestras in and around the Chicago area and is a highly recommended singer for original projects and commercial spots. Kim is proud to be the producer of Ladies of The Canyon, a group of supremely talented Chicago area female musicians who present 4 concerts a year honoring legendary female singer/songwriters. She is also a student of improvisational theatre, having studied at IO Chicago and is a graduate of The Second City Music Improv Conservatory . Ike Cole, brother of Nat "King Cole and an accomplished pianist and singer in his own right once said of Kim Frost, "she has amazed me with her talent to sing. She has an innate ability to understand feel and interpretation." 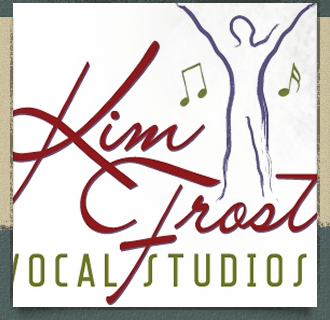 As a private vocal instructor for over 16 years, Kim strives to channel that ability in to her students. By giving them a strong foundation in classical technique, she stresses versatility in repertoire, style and interpretation. This allows her students to achieve whatever their musical goals may be.